Foraging bumblebees can detect scents left on flowers by previous bumblebee visitors and hence avoid flowers that have been depleted of nectar. Tarsal secretions are probably responsible for this repellent effect. The chemical components of the tarsal glands were analyzed by combined gas chromatography–mass spectrometry for three species of bumblebee, Bombus terrestris, B. lapidarius, and B. pascuorum. The hydrocarbons identified were similar for each species, although there were interspecific differences in the relative amounts of each compound present. The tarsal extracts of all three species comprised complex mixtures of long-chain alkanes and alkenes with between 21 and 29 carbon atoms. 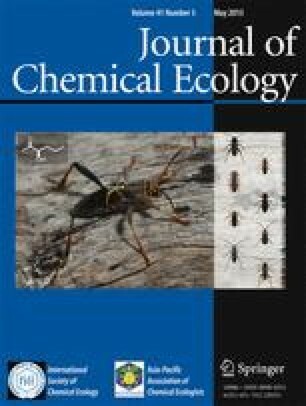 When B. terrestris tarsal extracts were applied to flowers and offered to foraging bumblebees of the three species, each exhibited a similar response; concentrated solutions produced a repellent effect, which decreased as the concentration declined. We bioassayed synthetic tricosane (one of the compounds found in the tarsal extracts) at a range of doses to determine whether it gave a similar response. Doses ≥ 10−12 ng/flower resulted in rejection by foraging B. lapidarius. Only when ≤ 10−14 ng was applied did the repellent effect fade. We bioassayed four other synthetic compounds found in tarsal extracts and a mixture of all five compounds to determine which were important in inducing a repellent effect in B. lapidarius workers. All induced repellency but the strength of the response varied; heneicosane was most repellent while tricosene was least repellent. These findings are discussed in relation to previous studies that found that tarsal scent marks were attractive rather than repellent.